An innovative online course offering resources about Autism Spectrum Disorder developed at Selkirk College appeared before a world audience at the Hawaii International Conference on Education taking place this January. 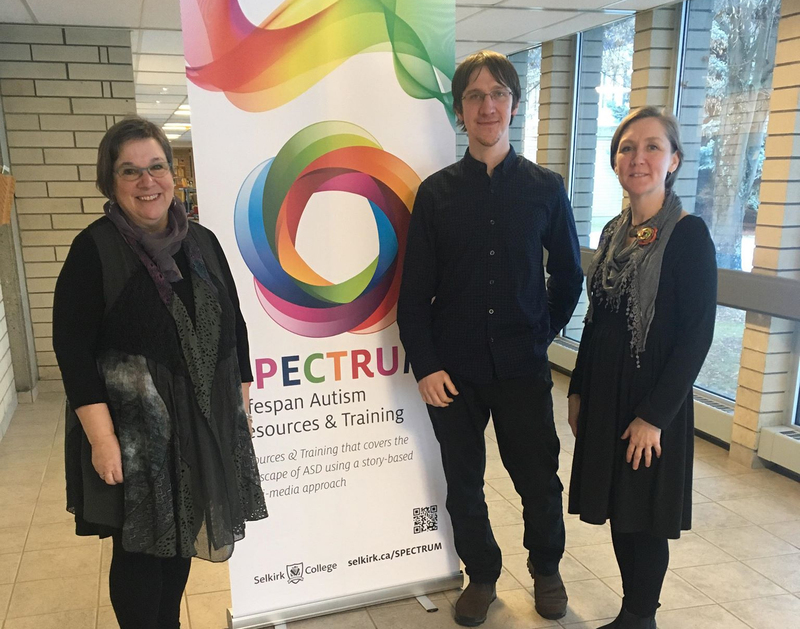 A year after SPECTRUM launched, many people in the West Kootenay and across the country have taken advantage of the Lifespan Autism Resources & Training according to Selkirk College Instructor Jane Green, one of the driving forces behind the project. Developed at Selkirk College, SPECTRUM is an innovative online course offering resources about Autism Spectrum Disorder showcased to a world audience at the Hawaii International Conference on Education. Instructors Jane Green (left) and Lisa Thiessen (right) are captured here with student David Blackwell. Almost four years in the making, with development funding from Columbia Basin Trust and local focus groups informing, SPECTRUM offers perspectives about Autism Spectrum Disorder (ASD) across the lifespan. Its lessons are presented using a story-based multimedia approach with interviews and real-life case example stories that elaborate on the content while bringing information into context. Accessibility for different learning styles was a priority, so course content is bright and engaging on screen using light board technology, strong graphic elements and video interview content. SPECTRUM content specialist Michelle Pozin says all community members can benefit from SPECTRUM, but it is invaluable for teachers and education assistants wanting to increase their qualifications and enhance their skills in a school setting. In School Districts 5, 8, 10, 20 and 51, this course meets the Autism Training Requirements. Selkirk College University Arts & Sciences alumnus David Blackwell is one of several people on the spectrum who are taking this online course. He feels the course content is an accurate representation of his lived experience with ASD. This year’s Hawaii International Conference on Education was the 17th annual event where academics and professionals from education and related fields from all over the world came together to learn from each other. More than 1,300 presenters from more than 35 countries attended early last month. SPECTRUM was part of a session of poster presentations in which the Selkirk College team shared about the course and their experience one-to-one with other industry professionals. Instructor Lisa Thiessen enjoyed conversations about the incredible work coming out of a small rural college. “We have come a long way in developing this incredibly important course that can now be taken by anyone around the world,” she says. In addition to presenting on SPECTRUM, Education Assistant & Community Support Worker Program (EACSW) instructors Green and Thiessen shared about a recent digital book club assignement that helped a group of Selkirk College students understand neurodivergent thinking and living with a disability. EACSW students read author Lorna Schultz Nicholson One-2-One series that includes four books featuring teens with ASD, Fetal Alcohol Spectrum Disorder, Down Syndrome and Brain Injury, and their "best buddies in highschool settings." The books Fragile Bones, A Time to Run, Born With and Bent Not Broken show how people can deal with situations in entirely different ways. After completing their novel studies, students presented projects to the author who provided personal feedback to each individual. Nicholson has been honoured with many awards for her writing which also includes the Amazing Hockey Stories series. The author is passionate about sports and her husband Bob Nicholson is the former Hockey Canada president. Enrol in SPECTRUM at Selkirk College. Learn more about Education Assistant & Community Support Worker Program.